Earlier this year, SAA Architects and Interior Designers fashioned a new, collaborative space for its Los Angeles-based client Stun. 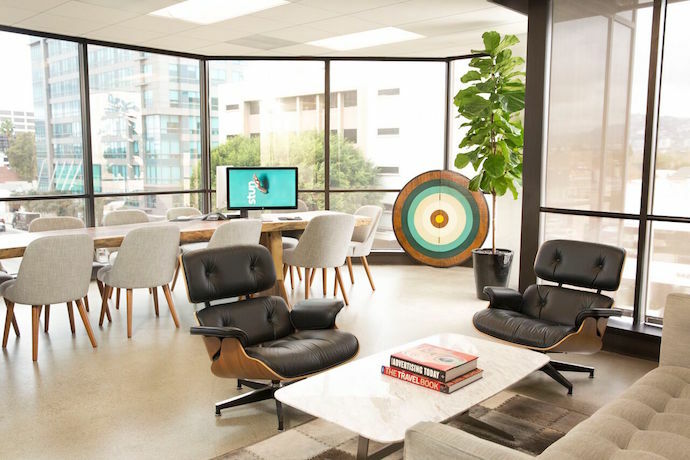 The entertainment industry content studio, ad agency and commercial production company wanted a branded headquarters that gave employees the opportunity to collaborate more freely. To deliver on this objective, SAA designed an interconnected staircase that links the new office’s third and fourth floors. It also installed an open plan design, but added custom-made wood louver walls to separate functional areas. A staircase connects the third and fourth floors at Stun Creative. Image courtesy of Alden Wallace. Stun Creative’s deck facilitates wellness opportunities, such as yoga classes. Image courtesy of Alden Wallace. Open plan and enclosed offices. Close to Los Angeles County Museum of Art (LACMA), La Brea Tar Pits & Museum, Petersen Automotive Museum, Craft & Folk Art Museum, and the Pavilion of Japanese Art. The oversized break room is one of the more unique features of the new headquarters. Image courtesy of Alden Wallace. Round table discussions with both senior management from each division as well as employees from varying divisions to insight their feedback as to how we can make the new space more functional for them. No surveys per-se, but we had numerous discussions with employees at every step of the process, including the construction process itself where we brought all staff to the job site to tour the space and get their feedback. We had to design a build a staircase connecting the third and fourth floors! Cutting out a 20-foot slab of concrete in a building required countless hours of design, engineering work and city approval. There was also the logistics in getting the staircase into the space, which required us to close down a section of Wilshire Blvd. and crane the staircase in through the third floor windows. Actually getting the staircase into the space involved shutting down part of the Wilshire Boulevard. Image courtesy of Alden Wallace. Absolutely. Once of the requirements we had when looking for a new space was a patio/area where we can host things such as weekly yoga for employees. Our new space has a patio where we’re now hosting yoga classes twice a week and are also promoting outdoor work spaces for employees to use (full wifi for those outdoor work areas). We also purchased all new mechanical sit-to-stand desks/workstations for employees so that they don’t need to sit all day at their desks to do their work. After talking to all employees, this was one of the things that everyone wanted in the new space. Custom wood louver walls for visual semi-privacy. These walls were utilized to maintain the open office feeling, while dividing some of the various functional areas. Allsteel systems furniture with integrated sit-to-stand desks, collaborative work areas, high tables for casual meetings, lounge furniture and café style seating. The new design features both open and enclosed workstations. Image courtesy of Alden Wallace. Graphic brand signage developed by Stun Creative, display niche for industry awards were incorporated into the design. 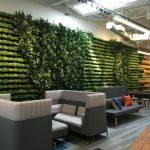 The oversized breakroom island/collaborative area, lounge furniture, accent lighting, and custom wood louver walls, as well as the interconnecting staircase between the third and fourth floors. Sit-to-stand desks, open floor plan, collaborative areas, lounge areas to encourage spontaneous employee collaboration and interaction. A variety of breakout areas give staff the opportunity to collaborate more freely. Image courtesy of Alden Wallace. Moving from shared offices to open workstations required a bit of getting used to. Whereas in the old office each group was somewhat isolated from one another, in the new space, we purposely integrated people from across all divisions in certain areas to insight better communication across divisions. Getting the buy-in from employees early on and making them part of the process. We showed employees the types of furniture we were purchasing and the layout of the space well in advance of the move so that there were no surprises when they showed up on day-one. Part of the branding at the new space involved designing a place to showcase Stun Creative’s awards. Image courtesy of Alden Wallace.